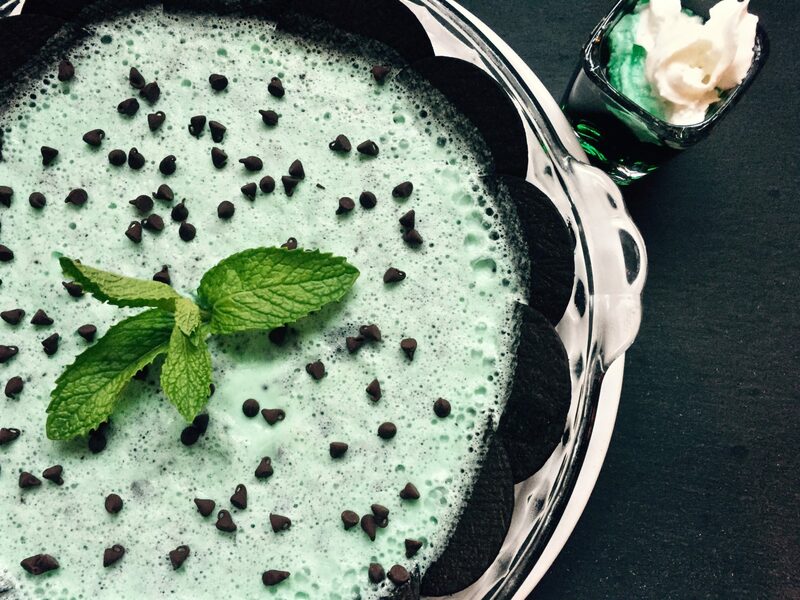 Grasshopper Pie is one of Tom’s childhood favorite desserts. I make it for him every year on his birthday. Today, we roll it out early in celebration of St. Patrick’s Day, not because it’s Irish, but because it’s green! The easiest way to make this pie is with a 9” pre-made chocolate crumb crust. However, I find those pre-made crusts aren’t deep enough to hold the entire recipe. Not to mention, the tin foil pan does not make for an appetizing picture. For today’s pie, I made the pie crust on the side of the box of Nabisco Famous Chocolate Wafers. This pie is an old-school minty chocolate delicious dessert that will have your guests clamoring for more and may even become a tradition as it did in our family. 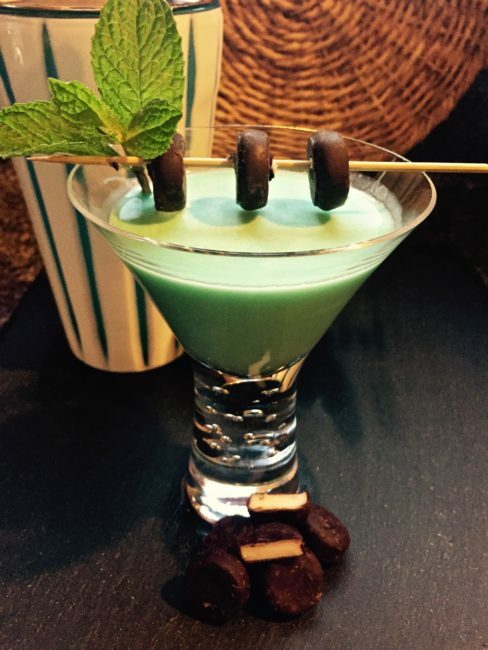 For your over-21 guests, if you would like to make an actual Grasshopper Cocktail that is really easy, too. Shake equal parts green crème de menthe, crème de cocoa and cream over ice in a martini shaker and strain into a cocktail glass. 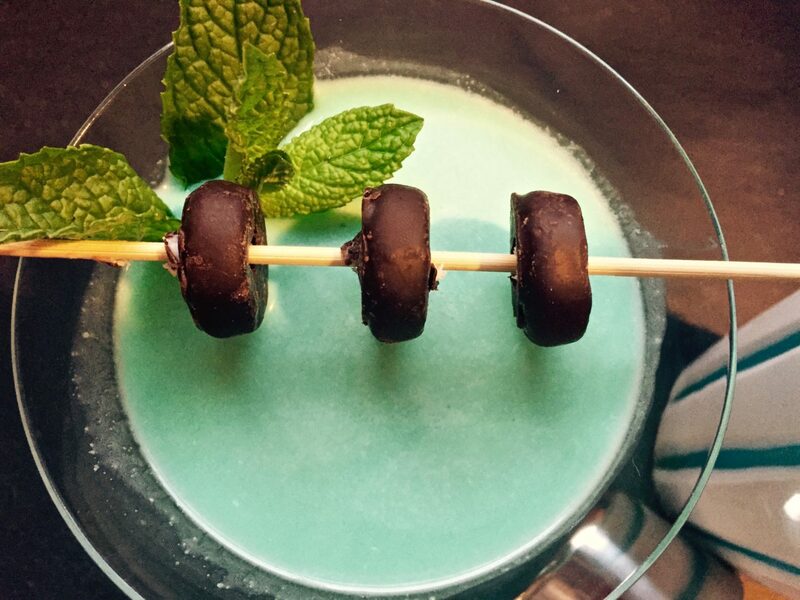 Garnish with something chocolate…maybe a dusting of chocolate or a sprinkling of chocolate shavings. 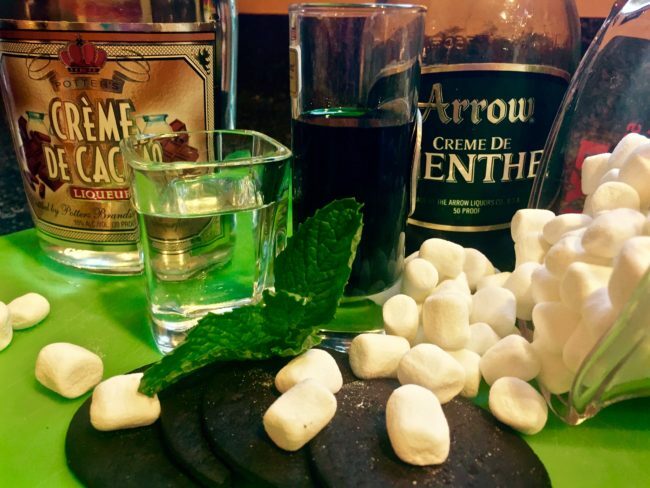 I used mini-York Peppermint Patties. Wishing you the luck o’the Irish! Preheat oven to 350°F. Cut 10 wafers in half and set aside. Finely crush the remaining wafers (I used the blender to get a fine mixture); mix with 3 T. melted butter or margarine until fully incorporated. Press into the bottom of a 9” deep dish pie plate. Stand the halved wafers around the edge of the pie plate, overlapping edges slightly and firmly pressing the cut sides into the crumbs to secure. Bake 5 minutes. Cool completely. Stir marshmallows and milk over a double boiler of simmering water until the marshmallows are completely melted. Let cool in the pan. Add a pinch of salt to the cream and whisk with a large whisk or hand mixer until the cream becomes more solid in texture and leaves semi-stiff peaks when you lift the mixer out. Stir in liquors until just incorporated. Fold the cooled marshmallow mixture into the whipped cream and pour carefully into the pie crust so as not to kick lose any chocolate crumbs. Cover tightly with Saran wrap. Transfer pie plate to a cookie sheet (easier to carry and won’t spill). Freeze overnight. Garnish with whipped cream and mini chocolate chips if desired. Serve immediately upon removing from the freezer as this dessert melts really fast.